Do you want to see how the new Cape Town Stadium looks like? The recent offical opening of the newly built stadium at the Cape Town Soccer Festival as well as the Rugby Festival on February 6, 2010 are the test-runs for the big event of 2010, the Soccer Worldcup which will be hosted by South Africa. So if you are not so lucky to see the stadium and its facilities before the big event for yourself, have a look at my stadium photos of the new Cape Town Stadium. This is the Cape Town Stadium as seen from the Parking Bays at the old Greenpoint Cricket Oval. By the way, the parking at the Soccer Festival was very well organized! There were many parking guards helping out and police was seen everywhere in the area around the newly build Greenpoint Stadium. There is parking outside the stadium and a basement bowl parking for 1170 cars. And there is free public transport with a shuttle service coming from the Civic Centre in Herzog Boulevard which was well organized too. The security personnel around the Stadium seemed to be well organized and very friendly. When we went to the Cape Town Soccer Festival by car there was no traffic congestion, neither before nor after the first soccer match at the opening of the Stadium. The trip to and from the parking home to Blouberg only took us 25 minutes, which is much less than at the daily rush hour;). The stadium covers 18 hectares of the 80 hectare Green Point Common, which houses a golf course and various sports fields and facilities. On this picture you will see the huge dimensions and the sweeping silhouette of the Cape Town Stadium. The translucent façade is constructed out fabric mesh which can be opened up and lit at night, which looks really stunning. The double membrane roof is covered by 9000 laminated glass panels and spectators are mostly seated under the roof while the pitch is open. With three main gates to the stadium and 88 turnstiles, the visitors can expect a quick entrance to the stadium grounds. And remember: You will have to show the contents of your bags and there will be body checks like at the airport. Also you will not be allowed to take any drinks or food into the stadium grounds. There are plenty of kiosk facilities and toilet facilities for visitors, VIP suites, smokers’ areas, a medical centre and police station too. 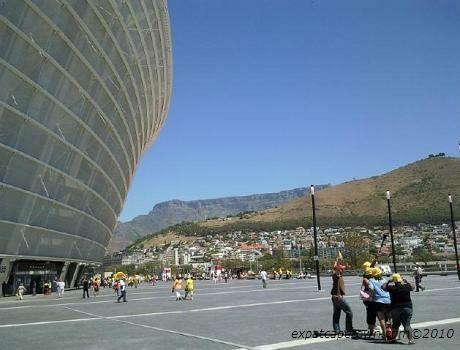 The Cape Town Stadium Soccer Festival on January 23, 2010 was attended by 20,000 visitors. 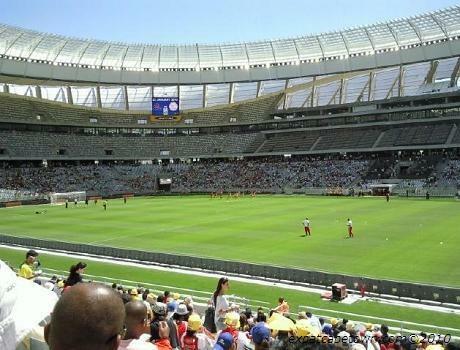 The Stadium in Cape Town however will offer up to 68,000 seats to visitors during the Cape Town Worldcup matches in June and July 2010. There will be entertainment on the stadium grounds before the matches and you can admire the stunning setting of the Stadium and the local scenery with Table Mountain, Signal Hill and the City Bowl. 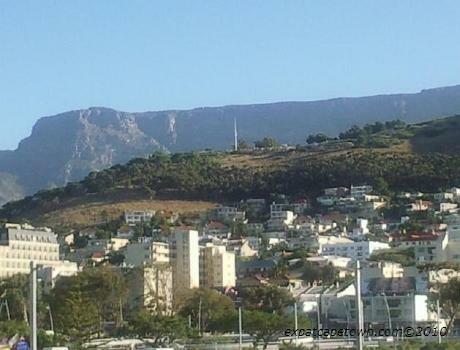 Here is a picture of the adjacent suburb of Green Point taken from the grounds of the stadium. 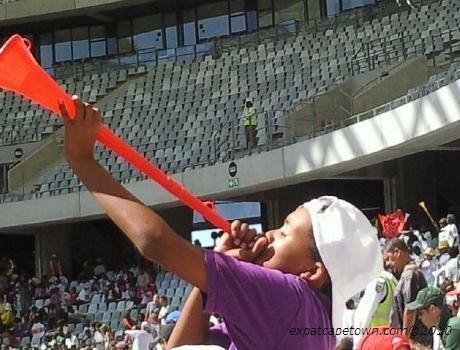 And not to forget the typical South African touch to the soccer matches: the Vuvuzelas. And take my ideas about the love-hate relationship with the local vuvuzela "noise". 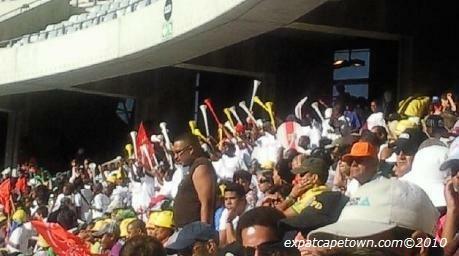 Well, it was really loud in the Cape Town Stadium at times! There were many people blowing the horns, especially as there were many vuvuzelas distributed for free by some local companies. There were many families queuing up for the red and yellow "treats". Give kids a reason to be loud, well, you have to bear the music…. By the way, the music of the vuvuzelas is as loud as a fighter jet flying overhead at more than 100db. Imagine that for the 90 min soccer match and you know that some earplugs will come in very handy! Interested in more interesting facts and typical South African football information? 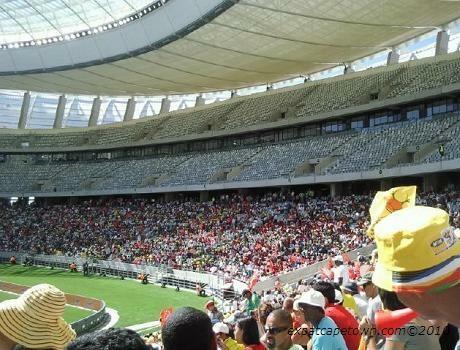 More info and more photos of CapeTown Stadium here.